A Maine lobsterman died this month after falling off a boat near Jonesport. The lobster boat crewmembers contacted the U.S. Coast Guard, but the lobsterman was dead by the time they arrived in spite of CPR attempts. The lobsterman left a wife and a young son behind. According to the Centers for Disease Control and Prevention (CDC), there were 210 reported fatal falls overboard in the U.S. between 2000 and 2014. None of the victims were wearing personal floatation devices. Approximately 53 percent of these deaths occurred when fall was unwitnessed by other crewmembers. That said, crewmembers should avoid working alone at all times. Falling overboard does not just entail falling into open sea. 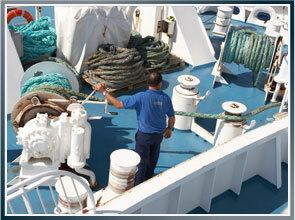 Maritime workers have also been known to fall between vessels and barges while loading cargo or handling fishing gear. Commercial fishermen are particularly susceptible if safety precautions aren’t taken, as they work with handling fishing gear over the sides of vessels. Worse, rescue efforts can be difficult and can place other crewmembers at risk for falling overboard as well. Those who do are susceptible to hypothermia, drowning and a variety of other dangers out at sea. Try to float – Crewmembers should be wearing a personal flotation device (PFD) at all times. Victims should remember that Cold Shock Response is natural and try to remain calm. Do not thrash around as that results in a loss of both heat and energy. Just stay still and float. Try to curl up, as stretching out will also cause heat loss. Signal – Crewmembers who witnessed a man overboard accident should work quickly to alert the rest of the crew or nearby vessels. Communication – Maintain a direct line of sight with the MOB while getting help. Mark the location – Throw life rings, buoys or marker lights to make man overboard visible. Prepare a rescue swimmer – Make sure the swimmer is wearing an immersion suit and something that tethers them to the boat. Latti & Anderson LLP is a maritime injury law firm that fights for those injured at sea. We have been helping maritime workers for more than 50 years. Previous Was the Tugboat Accident Near the Tappan Zee Bridge Avoidable? Next Should I talk to an Insurance Company After a Maritime Accident?